Indique is a word coined by merging ‘Indian’ and ‘Unique’ and so is their food. True to their name their food is a modern twist to traditional curries. Every dish is made with fresh ingredients and lots of care and love. Their award-winning head chef is one of the finest in the industry and will make sure nothing but the best comes on your plate and palate. The team at Indique pride themselves on their diner experience. They also love the environment and hate poverty. 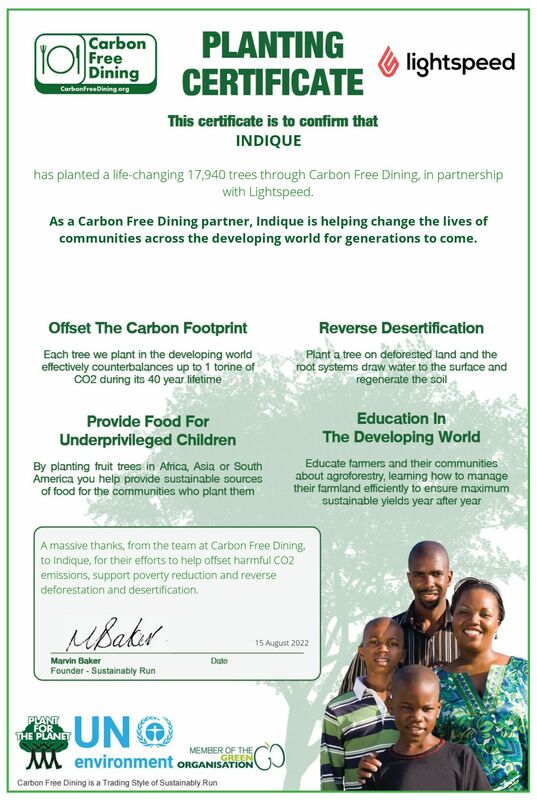 That’s why Indique has teamed up with the United Nations Environment endorsed Restaurant Initiative, Carbon Free Dining. For every bill presented at Indique, diners will be empowered to plant a life-changing environmentally friendly fruit tree. Each tree planted will counterbalance the Carbon Footprint and food waste of the meals on the bill and at the same time help end poverty.